Talking to children about the real meaning of Christmas is easy. There’s a baby born in a stable with farm animals! Angels! Shepherds! SHEEP! Yes, the Christmas Story is quite kid-friendly. The Easter Story is a little more difficult, however. In order to get to the happy part (Jesus Lives!) you have to tell the sad part–the part where Jesus dies on the cross because we are sinners. In reality, I think adults have much more trouble talking about death and sin than children do. 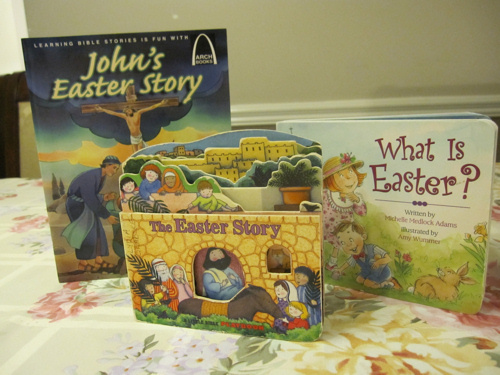 Fortunately, there are ways to tell this story that are fun and also share the importance of Easter. 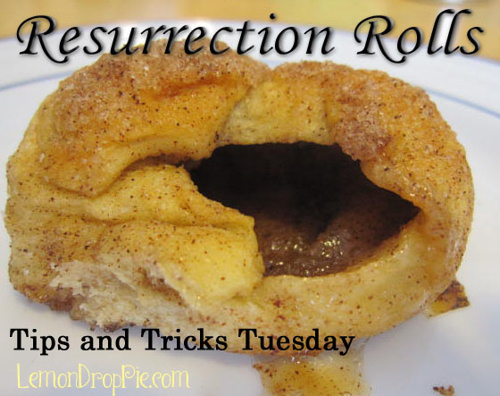 One way is to bake Resurrection Rolls. I’m not sure where the original recipe comes from, but it has been floating around the internet for years. To make them, you will need refrigerated crescent rolls, marshmallows, melted butter, and a mix of cinnamon and sugar. Take the marshmallow, and explain that the marshmallow represents Jesus. (Since I actually did these steps with my children, I don’t have pictures. Oops!) Dip the marshmallow into the melted butter and roll it in the cinnamon sugar. This represents the oil and spices with which the women prepared Jesus’ body. Next, wrap the marshmallow with one triangle of crescent roll dough. This represents the cloth wrapped around Jesus’ body. Pinch the dough together well. The marshmallow melts in the oven! Talk about the resurrection with your children, and how there was an empty tomb on Easter morning! Of course, my children (who should know better) began to talk about how they were eating Jesus. They weren’t being disrespectful–after all, aren’t we given Jesus’ body and blood during Holy Communion?–and I gently reminded them what the roll represented. Do you have any Easter activities you do with your kids? Share in the comments, please! My recent post Hold It Right There, Hombre! One great thing about Jude's Catholic school is that they cover all this stuff in school! That kid knows far more about religion and the bible than I do. The other night at bedtime, he announced "I think tonight I'll just read a little of the bible." I stared at him. Really? Wow. And he did. He read for about 30 minutes, and then we talked about how he prefers the new testament to the old and why. Blew me away. Anyway…the Resurrection Rolls look pretty damned good! I wonder if I could work some chocolate into them. What could I make the chocolate represent? A chocolate bar could represent the stone rolled away, of course! 😉 I like the way you think! Both my husband and I went to Lutheran grade schools, and it was tough to decide to send our daughters to public school. So I do try to teach them religion at home, but I'm not very consistent! Thank goodness for Sunday School! I think we may try these this year! I forgot to add that I brushed the leftover butter on top of the rolls, and sprinkled them with more cinnamon sugar. They were so yummy!